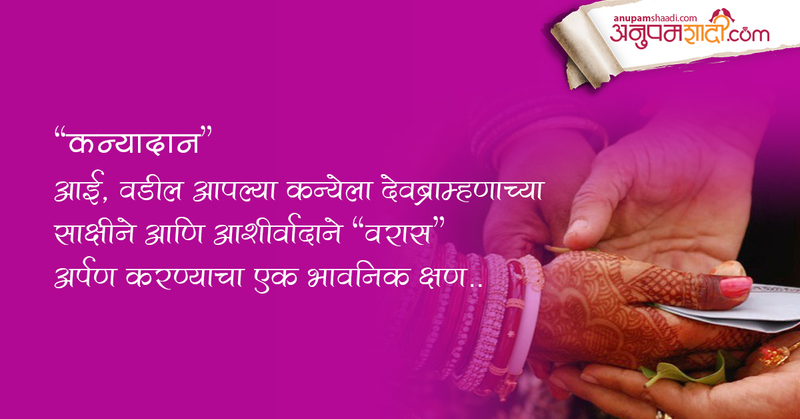 Kanyadaan ceremony is one of the most important and popular rituals in Marathi wedding. This ceremony is very emotional for the bride and her parents. In this ceremony, the parents of the bride give away their daughter to the groom. So now its groom’s responsibility to take proper care of her and to give her lots of love. The pandit asks the groom to join his palm and then he asks the bride’s mother to pour the holy water on groom’s palm. While the bride’s father request groom to accept his daughter as his life partner. The bride also promises that she will always stand by his husband no matter what the condition arises. She also asks her husband to never go against his limits and to love her unconditionally. The marriage rituals continue after Kanyadaan ceremony is completed. Visit our Facebook page for new offers and discounts. Why to Join Anupamshaadi: Marathi Matrimony website? © Copyrights 2015 at www.anupamshaadi.com | Developed By VoyageSoftech Pvt. Ltd.